I went to the doctor yesterday and he said I can start putting weight on my leg. Finally. Now, one step at a time, I'm getting closer to being healed and back to my normal life. I have about a month left with crutches (my leg isn't strong enough to hold me up all the way yet, I definitely still need them) and then I get a cane (ha!) and then eventually, I can walk on my own. I'm aiming for Thanksgiving. My sweet scar is covered here, but look at my flickr (link at the top of the page) if you want to see it. Its big. My boy friends are jealous. And oh, you didn't know I have tattoos? Surprise. 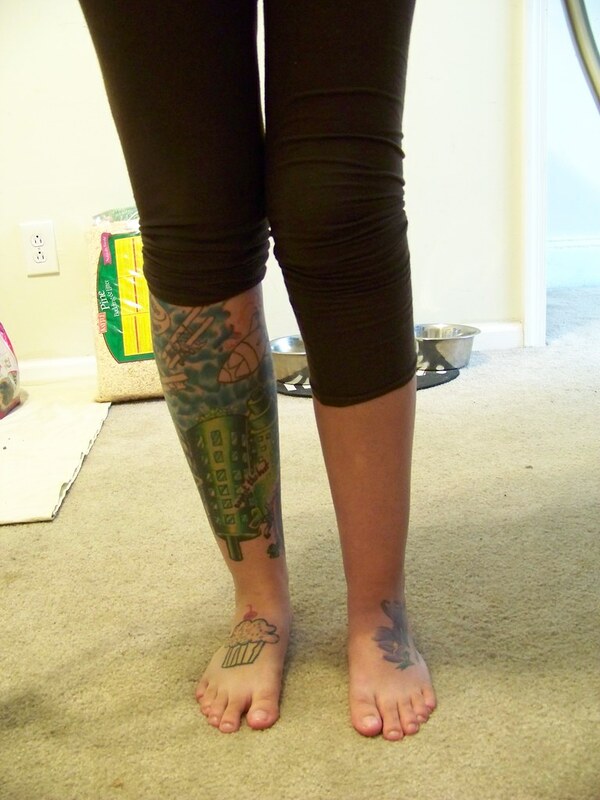 Maybe later I'll put up a picture in shorts so you can see how skinny my leg is and how huge my knee looks. Ihope none of you ever break your leg, or anything else, like this. Oh, and also, I'm back in Philly. OMG - I LOVE your cupcake tattoo!! Is it a GF one? :) Did you get the tattoo locally? I'm ready for a new one and need to find a reputable artist in Philly/NJ. Thanks, I got the cupcake before I was GF (I have a pizza one too that I got right before I went GF). Yes, I did get it done locally, but my friend who tattoos moved to Hawaii, so now I don't know anyone local!! !